P4poetry and P4pune - First Pune Poetry Meet!!! Known for attracting students, retired people and home to a peaceful life, Pune city just added another jem to its crown! – p4poetry.com poetry meet circle!Jointly organized by Vishvnand ji/Viju and hosted by Viju, the meet was a very friedly affair. Even the location was refreshing; a beautiful garden in Viju’s home- ‘Prerna Villa’, aptly named so!! A round of three-cheers for them and all the other pune members!! The meet has a very varied attendance, with people from every profession. 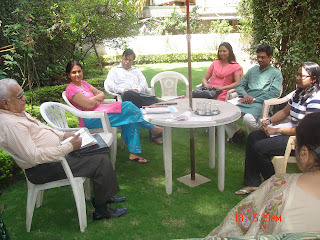 Apart from some well known p4poetry members like Harshkant Sharma, Vinod, Vishvnand ji and Viju, we had some very talented non members as well, like – Diksha Neel, Varsha, and three poetry appreciators who prefer to listen, rather than write ie. Mrs. Viju Sood, Mrs. Gaitonde and Paresh! Also, two of the founder members, Preeti Datar and Vikash Kumar, loved being the guests for once! After the customary introductions and exchanging words, the poems began to flow. 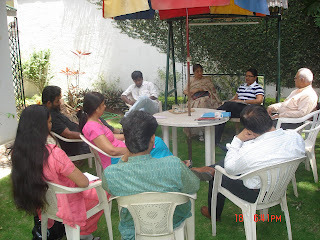 Vishvnand ji’s situational and insightful poems, Vinod’s social cause poetry, Varsha’s short but deep set poems, Diksha’s beautiful words, Vikash’s masterpieces, Harshkant ji’s inspiring poetry, Viju’s easy to understand, yet very likable and relevant poems kept everyone rapt for nearly two hours!! Harshkant ji and Vikash cited shers and two liners for several well known poets and those just lifted the mood further! 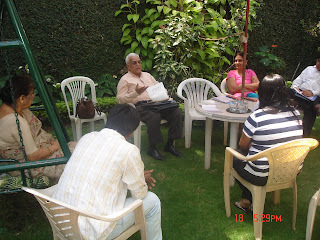 Apart from the poems, the discussion were in plenty- what language do you think in, do poems come to you naturally/do you consciously sit to write a poem, hindi vs. English poetry (Hindi won….for the sheer fact that it lets us personify things, be more expressive and connect more with the audience! ), writing about nature…..and the like. The meet was followed by lunch at a nice vegetarian restaurant and also helped members mingle beyond just poetry. Having spent nearly 4 hours the poetic bliss, the Pune members already are excited and totally geared up to host the met next meet and also a musical night with some special guests. Also, Pune p4p members invite all Mumbai p4p members for their future meets; after all they’re confident that 6 hours of travel will be totally worth it! Now that’s a promising start! February was a special month.We launched SMS poetry on our website and all SMS poems published on our website were eligible for the contest. We got an overwhelming response. ! !